Supports one M.2 PCIe (NVMe or AHCI) SSD and a second M.2 SATA 6Gbps SSD simultaneously. Converts one M.2 (M Key) interface to PCIe 3.0 x4 interface (PCIe 2.0 Compatible). Converts one M.2 (B Key) interface to SATA 6Gbps interface (SATA connection required). 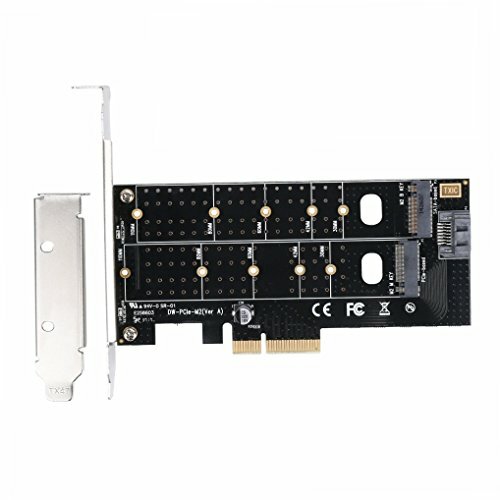 NGFF M.2 to PCIE Adapter Card, Support B Key & M Key Dual interfaces. KEY-B can be inserted into the M.2 NGFF SATA protocol solid state hard disk, and then plug into the SATA line to connect the motherboard, PCIE power supply, no external power supply. KEY-M can be inserted into the M.2 NVME PCIE protocol solid state hard disk, PCIE channel data transmission, without external SATA line can be used. Supports one M.2 PCIe (NVMe or AHCI) SSD and a second M.2 SATA 6Gbps SSD simultaneously. Supports M.2 form factors 2230, 2242, 2260 and 2280 22110.